Cristina can't hold her excitement cause we make the impossible, possible. 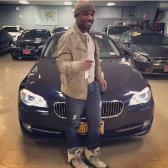 Tomas, loves his 535xi and loves Showroom Auto equally!! 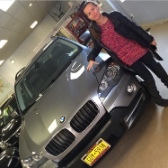 HAPPY CUSTOMERS ARE EXTREMELY COMMON AT SHOWROOM AUTO.. I just purchased a 2011 S550. Dewan, Chris and the entire team were excellent. Chris worked hard to make the deal happen. All questions were answered and there was no pressure to buy. I've been buying cars for years, this is my 19th car purchase. But I have to say this was one of the easiest and best car purchases so far. Going back in a few months to buy another vehicle from this team. Full Name: Gilberto Showroom Auto in Long Island City is a great place to purchase your next vehicle. Today I was able to purchase my first car from Showroom Auto and it was a great experience. Dewan was my Salesman who took great care of my needs. He referenced all available options for me and when we settled upon a down payment I was able to give he landed me in my Camaro. After the test drive the rest was pretty much history. The cars they have available in their showroom are of fantastic quality and if you didn't know any better you would think they were new and not used. Chris my financial adviser gave me great knowledge and advice in regards to my loan and was able to get me a down payment I was comfortable with. He was also great help and extremely swift in regards to getting all the paperwork ready for the vehicle. I thank both Chris and Dewan for their great customer service. I will always come to Showroom Auto for any and all my vehicle needs and will recommend friends and family to do so as well. Thank you again for your service. 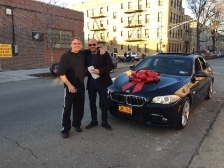 My experience with Showroom Auto was very smooth - big thanks to Dewan and Chris for my first German car. Their cars are all personally hand picked out with the best prices and mileage in mint condition no accidents. Specifically, my car had also been certified pre-owned and it has been 4 months now with absolutely no problems. Not only has the car been great, but the service these two gentlemen provided were unlike any other used car dealers. I would definitely recommend all my friends and family to check them out for their superior services. These guys are best. They got me into the car I wanted with no problem. Their cars are spotless. I would definitely recommend them to anyone looking for a car at a great price. Went there to look at a great car with one previous owner spoke to Michael who helped me with everything, they really go above and beyond they are not pushy or in a rush to sell you anything they let you take your time and actually let you think about all your options. Really good people that make you feel comfortable about buying a car and that's how a dealership should me you feel. Very happy with my purchase. I have purchased many cars in my lifetime. I owned everything from Infiniti to Lexus. I came to Showroom to buy another 5 series BMW. Dewan and Chris were by far the best car people I have ever met. They got me the car I wanted and at the price I wanted. They treated me like a KING and I recommend that you go no where else. Dewan and Chris the best in the business!!!!! I came here for a 2011 Mercedes- Benz C300. Don't bother with any other places. The people at Showroom Auto made the process easy and worry free. Uri and Dewan were patient, attentive, and never once made me feel pressured into any kind of car or deal. The Finance Manager worked out financing that worked best for me, even with my bad credit. The whole process was quick and painless. I referred my cousin, who wound up getting a Camaro, and Showroom Auto made a payment on my new car for me. I am taking this opportunity to write and tell as many people as I can about my recent experience at Showroom Auto in Long Island City https://www.licsho.com/. Chris, the manager, and his team not only have a variety of pristine condition beautiful cars in the showroom but alike the cars the quality of service I received was superior amongst its competitors. Chris is not your “typical car salesman” or manager. You all know what I’m talking about. However, just minutes in the Long Island City Showroom will cure you of your stereotypes. He really gets personally engaged in whatever situation you may be in whether that is a direct purchase based on your specific needs and vehicular desires, a trade in and even if you’re in an unfortunate poor credit, negative equity issue. Chris went above and beyond for me. He was always in constant contact with me every step of the way.  I was not in a good situation and he worked very hard to assist me and get me into a better spot with my credit and car. This letter is a small token of my appreciation of Chris and the team at Showroom Auto. Thank you for your help and respect in being honest every step of the way. I’ll be back to visit soon and the next time I’m looking for a car I know you’ll have one in your immaculate showroom that will be love at first sight….again. I urge you all to check it out. They have the inventory listed here https://www.licsho.com/. If you don’t see what you are looking for and nothing on the site changes your mind, call them 718-349-9600- they get new cars in weekly. Good luck!